Launch, roll on its side, extend the foils and fix, wade out to deeper water, right and sail away. ﻿LAUNCHING options,﻿ look at the wind direction because lee shore launches are much more difficult to get right. Also look out for obstructions, like moorings, shallows and underwater weed. Launching the RS600FF is in some ways similar to a keel boat or the International Moth. 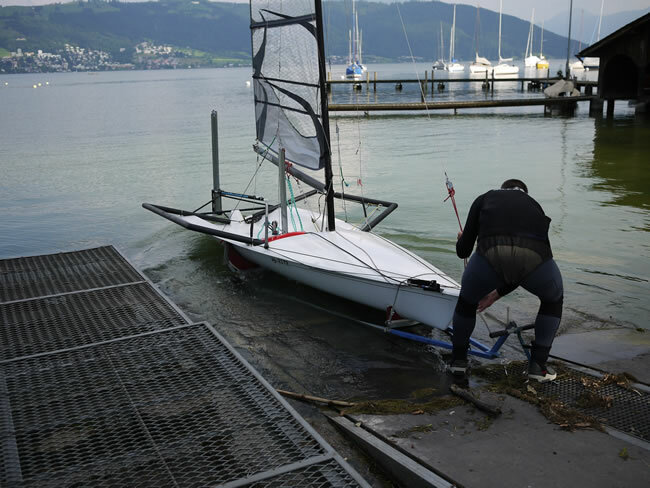 Each have their challenges which makes it more difficult than launching a conventional sailboat. The objective is to launch from the shore, push down the foils, secure the pins and attached the flap controls. Consider the wind direction and look at which side of the dagger-board the boom is lying in the boat. Because when the sail is at the top of the mast the boom is not able to swing across both sides of the cockpit until the dagger-board pushed down. Knowing this before launching can help you prepare before you get into trouble. Always pull up the mainsail facing head to wind with the boat on the trolley. Pulling the sail up when boat is lying on its side is much harder than when its upright. The mainsail halyard can be difficult to pull up the mast. This occurs with forestay tension on or if the sail battens are in opposing positions. This puts pressure on the sail track, if it is very difficult you can use a sail track lubricant. Loosen the rig tension and make sure the battens are parallel to each other (all on the same side). Help the sail up by pushing from below the batten ends. Here are two different methods to launch (3) & (4). Launch off the trolley, hold on to the windward wing by the shroud, reach across to part extend the daggerboard foil just low enough so that the boom can move freely to both sides of the boat. Leave the elastic attached to the top of the daggerboard otherwise the daggerboard will fall lower before you get to deep water. Lower the rudder 1/3 and step into the boat, sail away from the shore on a broad reach. Fully extend the foils, secure and attach the flap controls. Watch me getting into difficulty with WEED!